(Left to right) Nasarima Foster ’09 (English), La’Ema Vanterpool ’07 (Psychology/Black Studies), Michelle Dancey ’07 (Anthropology), Terrance Dancey ’06 (English), and Arlene Dyer ’05 (Elementary Education) ’09g (Special Education) at Youth Mission Outreach’s weekly Youth Night program in Poughkeepsie on a recent Friday night. For one group of alumni, New Paltz served as the place where they connected. But their relationships took on an entirely new purpose at a community organization just across the Hudson River. 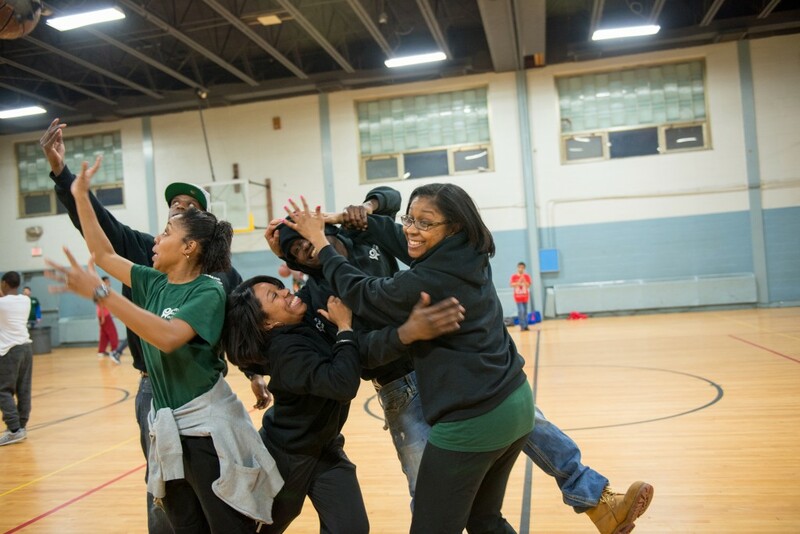 For more than two decades, Youth Mission Outreach (YMO), a nonprofit non-denominational ministry in Poughkeepsie, has served as a haven for thousands of inner city youths through program offerings based on Bible teachings. The organization is largely staffed by New Paltz alumni, some of whom have been involved with the program since their childhoods. Additionally, YMO’s internship program is almost entirely composed of current New Paltz students. Angel Henderson (left), 12, and Loquanis Keys, 11, staff the Kids’ Corner snack bar at YMO’s Youth Night, which helps sharpen their entrepreneurial and customer service skills. Parish Chanel Tolbert ’10 (Childhood Education) ’14g (Literacy/Special Education) started attending the program when she was 6. While attending New Paltz, Terrance Dancey was the assistant captain of the men’s basketball team. He also met his wife, Michelle Dancey ’07 (Anthropology), at New Paltz. “When (the kids) see the same people over and over again, they know that, even if their lives are chaotic, this is at least one thing that’s consistent,” said Michelle Dancey, a former resident assistant in Crispell Hall, who works as a church pastor and a counselor for mentally disabled individuals. 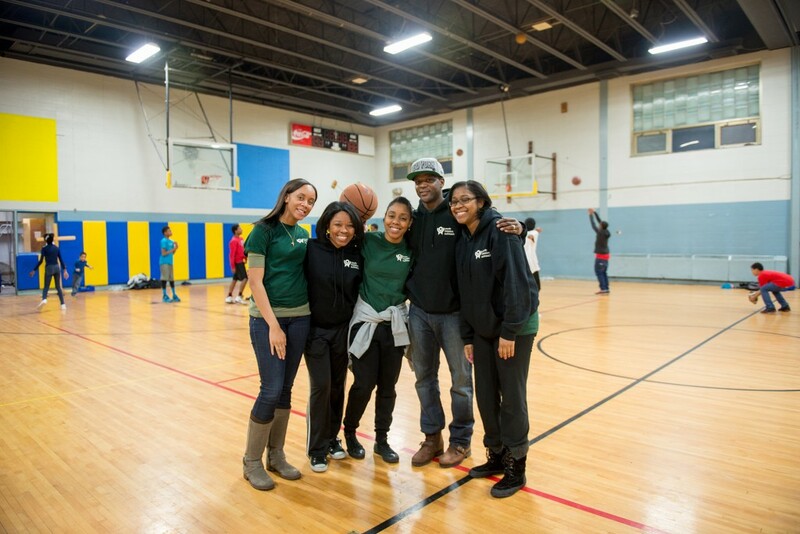 Sociology major Promise Bruce ’15 interning at Youth Mission Outreach’s Youth Night in Poughkeepsie. The organization’s most well-attended program, Youth Night, serves 75-125 kids (ages 5-18) each Friday. 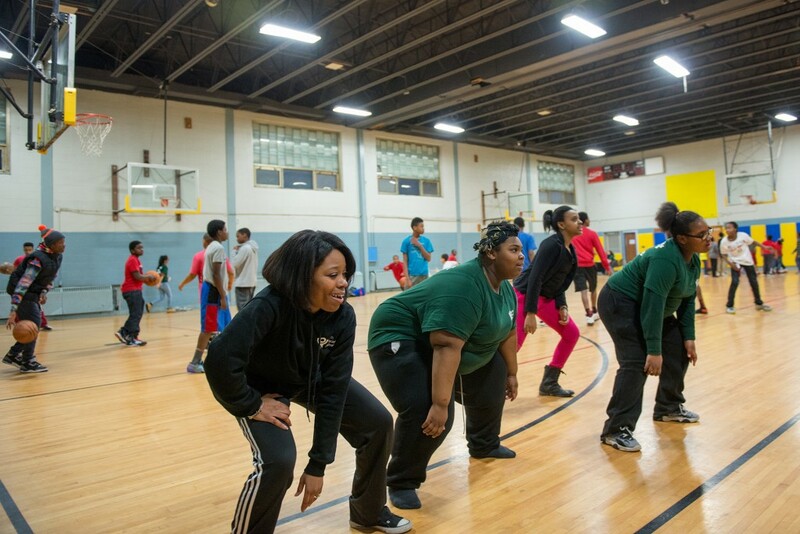 Attendees enjoy an open gym with basketball and dancing; group games; and free dinner with food donated by the community. Each Youth Night ends with “an encouraging message of hope that they can do great things,” said Arlene Dyer ’05 (Elementary Education) ’09g (Special Education), YMO’s intern and volunteer coordinator, who works as a special education teacher in Poughkeepsie. 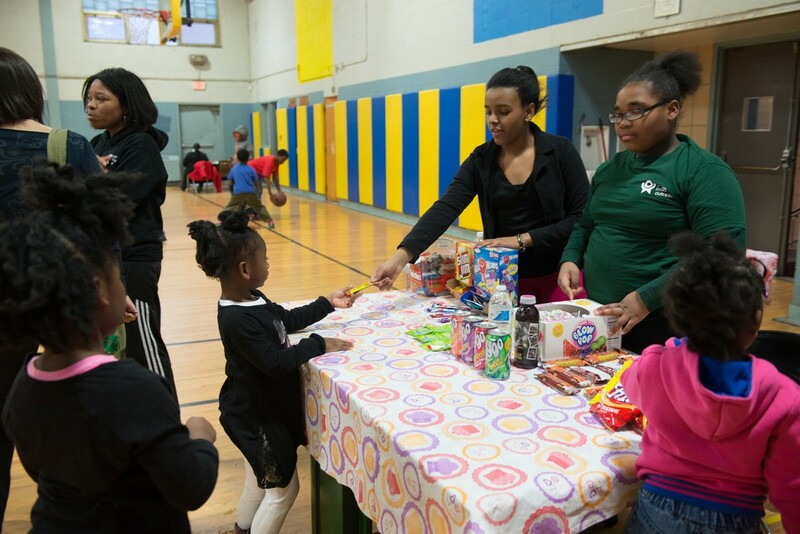 Another component of Youth Night is the Kids’ Corner, where select children earn a few dollars a week to run a refreshment stand in the gym (which is deposited into savings accounts that YMO opens for them). 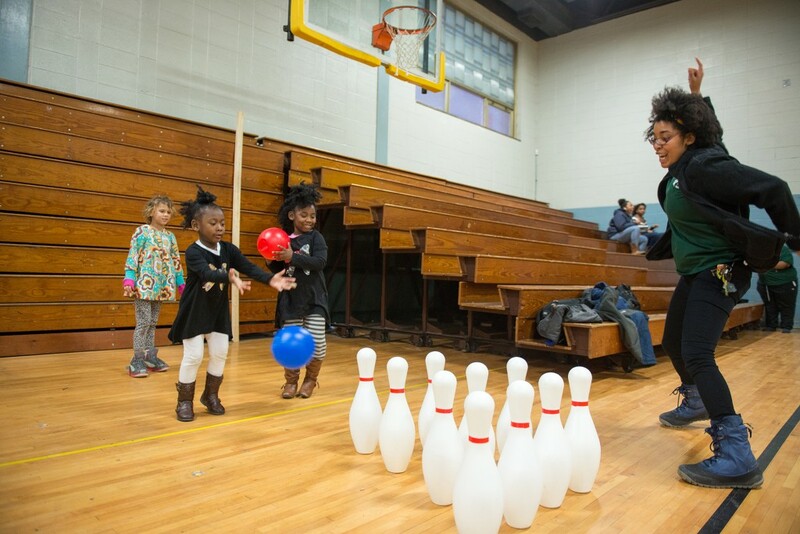 La’Ema Vanterpool ’07 (left) began working at Youth Mission Outreach in 2006 when fellow alum and YMO staffer Michelle Dancey ’07 asked her to come teach kids how to dance. “It’s a beautiful campus, and the community is very friendly,” said Vanterpool, who also worked as a resident assistant in Crispell with Michelle Dancey and Dyer, as well as in the EOP office and Martin Luther King Center. She became involved with YMO in 2006, when Michelle Dancey asked her to come teach the kids to dance. Vanterpool recalled EOP Assistant Director Rita Celariste ’89 (Communication Studies) ’97g (Humanistic-Multicultural Education) and psychology Professor Glenn Geher as two of her biggest influences at New Paltz. Though they’re no longer at New Paltz and have moved on to a variety of professional positions in the community, YMO is the glue that holds this cohort together – and it’s a labor of love for every one of them. In addition to those interviewed and/or photographed for this story, other New Paltz alumni working at YMO include Alyce Snead ’05 (Sociology) and Nancy Desole ’00g (Special Education).